My mind has been all about summer lately and with that comes my appetite for things like fried chicken, fresh corn, and seasonal fruit pies. While jotting down my week’s grocery list, I got the idea to make my own crispy chicken tenders. Flipping through a few cookbooks and some recipes online, I came upon a recipe from none other than celebrity southern belle Paula Deen. I tweaked her original recipe a little and added a bit of my own taste plus a couple of old fashioned techniques I picked up from Thomas Keller’s Ad Hoc at Home. 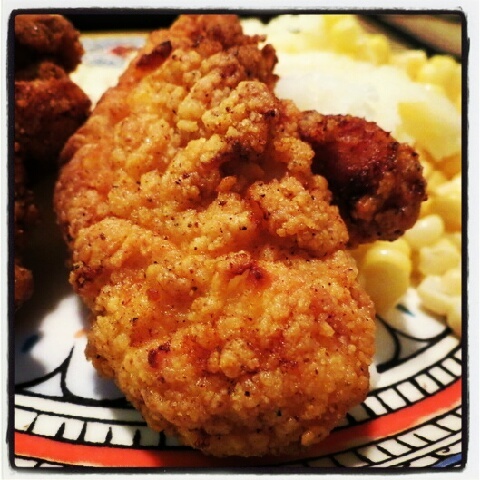 The result is a very flavorful chicken tender that is juicy on the inside and coated with crispy goodness on the outside. Recipe and directions follow the jump. 1. Rinse chicken tenders and pat dry with a paper towel. Season with salt and pepper. 2. Place buttermilk into a deep bowl and add Tapatio, crushed garlic, and chicken. Refrigerate at least 2hrs. 3. Prepare breading mix in a large ziplock bag. Add flour, paprika, salt, pepper, and garlic salt and mix until well incorporated. 4. Preheat oil and butter in cast iron skillet or deep frying pan until 375 degrees. Preheat oven to 450 degrees. 5. Working in batches, place tenders in bag and thoroughly coat, shaking off any excess flour mix. 6. Fry tenders for 3 minutes on each side until golden then place tenders on a wire rack placed on top of a cookie sheet. When all tenders are fried, place in oven for 10-15 minutes until deeply golden and chicken is cooked thru. 7. Serve with your choice of sauce.